Buy Privet Hedging (ligustrum vulgare) online from UK hedging supplier of cell grown hedges and trees. 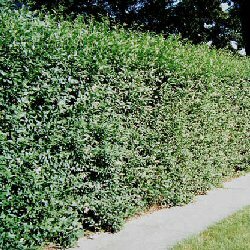 Privet (Ligustrum vulgare) is a well-known, native, British hedging species. Semi-evergreen, which means it will shed some leaves over winter, but still retain leaves for creating a screen for privacy. It is very commonly planted as it makes an attractive, tight hedge which lends itself to trimming and manicuring. Its leaves are an attractive, dark-green and it carries long clusters of shiny black fruit in autumn, if untrimmed. Privet can reach a height of 3m (10ft). Our Privet hedging trees are sold as plug plants, in other words the roots are encased in compost. This means that planting can be carried out at any time of the year, provided they are watered in periods of drought, compared to bare-root plants which can only be planted during the plants normal dormant period (November to March). All of these trees are UK grown, which is important for successful establishment. How many Privet hedging trees do I need? We recommend planting 6 plants per metre using the double staggered hedge method for a thicker hedge.